I've been trying to picture a Venn diagram that maps out the (many) different styles of Anchorage's pizzerias. Amusingly (to me at least), I imagine a tableful of pizzas arranged crust-to-crust with very little overlap. One pie would represent your upscale, "destination" restaurant, where you might order a kale and goat cheese pizza washed down with an artisanal hard cider. Another pie would represent the cozy, candle-in-the-Chianti-bottle, Dean Martin-on-the-sound-system, old-school Italian restaurant. Another is the neighborhood joint, complete with popcorn popper and arcade games, where the Little League team has its pizza party. And that's just to name a few. To be honest, I like all of these types of pizza parlors. Some days I want my pizza topped with a quail's egg and salmon roe while some days I want to eat a cheesy, saucy pepperoni slice and try my hand at winning a stuffed Minion from the claw machine. These pizza dishes share a name but not much else. Enter Saverio's Pizzeria, a newish spot at Midtown's Metro Mall that, to me, occupies a bit of a sweet spot — satisfying several of my contrasting culinary cravings under one roof (minus the stuffed Minion). First, Saverio's satisfies my strong penchant for East Coast nostalgia with its classic, New York-style pizza. My daughter and I shared a slice of plain cheese (the ultimate litmus test, $3.50) and it was tantalizingly close to what I grew up eating in by-the-slice joints in New York and New Jersey. The crust was thin on the bottom but pillowy at the circumference, with a cheese-to-sauce ratio that mightily favored the cheese. It was straightforward and satisfying. The stromboli ($9.99) was similarly old school. Basically a calzone by another name, this version is stuffed with ham, salami, sausage, pepperoni, sausage and, of course, cheese. It was as filling and delicious as the imposing list of ingredients would suggest. But Saverio's also has a lighter, more modern side reflected in special pizza toppings like goat cheese, Gorgonzola, eggplant and pork loin as well as offerings like the fresh mozzarella and prosciutto panini ($12.99). 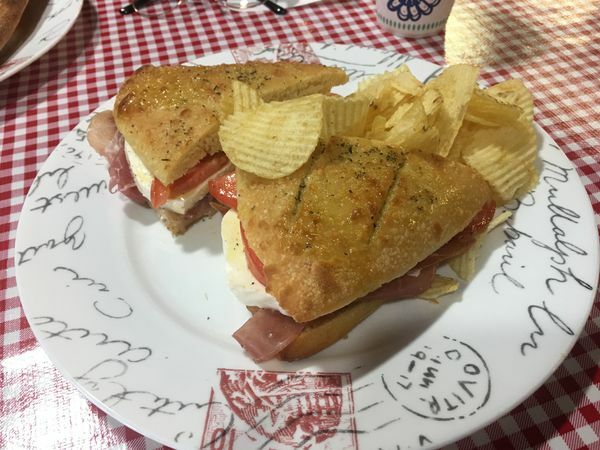 This is a comparatively elegant construct, with thick slices of cheese and tomatoes balanced by paper-thin slices of Italian ham and grilled in between slices of herby, house-made focaccia bread. It's simple and sophisticated and designed to show off high-quality ingredients. 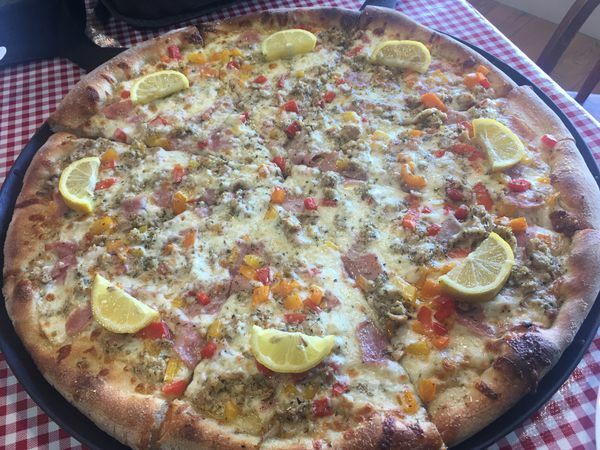 We returned the following week with one clear objective: to try the intriguing-sounding Clams Casino pizza ($26.95) that captured our interest during our first visit. While we waited, we decided to share an appetizer plate of meatballs ($7.95), which proved to be a tactical error. First of all, with the sauce and the wedges of house-made bread, this is a giant plate of food. Secondly, while I liked the flavor of this classic dish, I was put off by its rather spongy texture. I wondered if they had been frozen and then quickly thawed out? But when our pizza came, all was forgiven. Chef Saverio delivered this pie to our table personally and served up our first slices with obvious pride. A blanket of mozzarella cheese studded with chopped clams, bacon and diced pepper, this dish does away with the notion that seafood and cheese shouldn't share a plate. The combination is decadent and delicious. The pie is served with a garnish of sliced lemon which lent acid and freshness to this otherwise super-rich pie. I now think that a squeeze of lemon could brighten up any pizza combo. I'll report back on my findings. I couldn't help but notice during my visits that Saverio's stuffed pizza — a Chicago-style specialty — was doing a brisk business among customers in the know. So I decided to go back a third time to see what I'd been missing. And I'm so glad I did. The slice ($6.95 for a slice with three toppings) features a double dose of dough — the crisp outer layer and the moist, buttery inside layer – stuffed with pepperoni and cheese. The whole thing is then topped with more cheese, the special toppings of the day and is then blanketed by a generous ladling of rich, slow-cooked tomato sauce. It's the Russian nesting doll of pizzas. And I loved it. As an afterthought, I brought home a slice of bruschetta pie served Sicilian style ($4.25) for a late-night snack. If the stuffed pizza was rich and decadent, this was its pizza opposite. 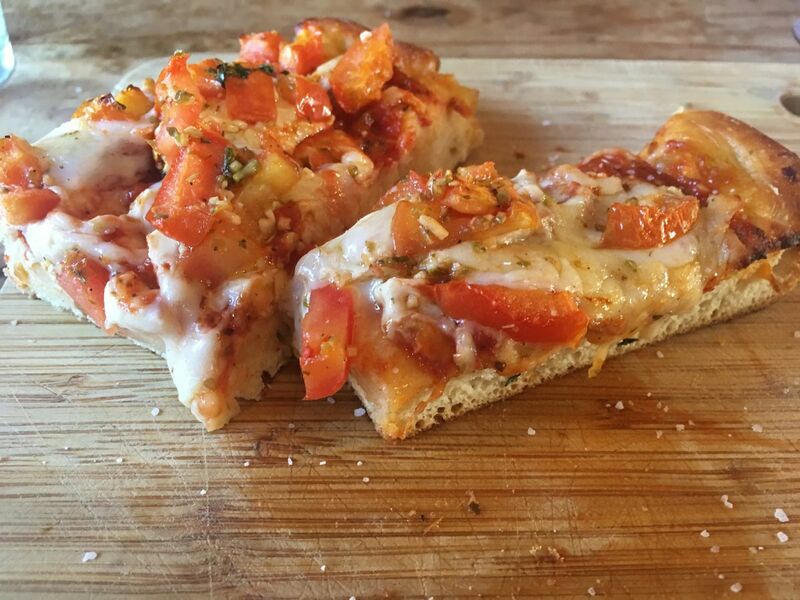 A light and fluffy crust with a bright, barely cooked topping of diced tomatoes and herbs, eating these two pizzas in the same day was the perfect way to show off Saverio's culinary nimbleness and range. The atmosphere at Saverio's is, like its menu, modest, eclectic, and pleasing, with a few high-end surprises. On the one hand, the restaurant is a quick, seat-yourself, by-the-slice lunch spot with plastic flatware and paper cups. On the other hand, the dining room has an unexpectedly serene quality that invites you to slow down and stay awhile. Red-checked tablecloths, charming (if a bit corny) Italian murals and music of the "O Sole Mio" variety are all pleasantly if predictably transporting. Large windows and high ceilings create a feeling of space and airiness. Service is warm and familial. On my first visit, my daughter and I were in and out in less than half an hour. On my last visit, I brought my laptop and self-indulgently settled in to nibble, sip, and write. 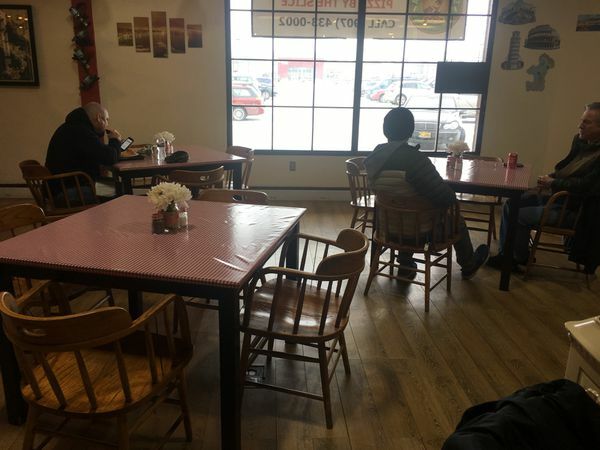 Saverio's is perfect for both kinds of visits. Location: 530 E. Benson Blvd.